Lo-fi is an extremely ambiguous word. By definition lo-fi is “music in which the sound is of a lower quality than the usual standard.” But as of late the term lo-fi has come to mean a whole lot more. It all comes down to authenticity. Free from studio sheen and basically any production whatsoever, lo-fi is considered by some to be the most genuine and pure music – and about as un-mainstream as it gets. Lately we have had a slew of lo-fi bands emerging on the music scene, and despite the unpolished sound, these groups have achieved both critical and financial success. So far the vast majority of lo-fi groups have come from America, but now along come Male Bonding and put England’s name on the lo-fi map. Ironically Male Bonding is signed to the American label Sub Pop Records. But despite the cultural differences, the two seem like an ideal fit - Sup Pop essentially introduced the world to lo-fi. Male Bonding is definitely not the first group to release fuzzed-out noise rock tracks in two-minute morsels. Groups like Japandroids, Girls, Happy Birthday and Surfer Blood have all, in their own way, attempted to resurrect and then amalgamate bygone musical eras - 60s surf-pop, 70s punk and 90s grunge. 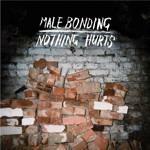 Male Bonding’s debut, Nothing Hurts, stands out from the pack with their more mature, melancholic and melodically appealing take on the lo-fi sound. Musically, Male Bonding is firmly rooted in frenetic and energetic garage rock territory. Production is virtually non-existent, scuzzy but not aloof. However it is the lyrics that give Male Bonding an edge over their lo-fi peers. Whilst most other groups of similar ilk submerge their vocals in thick layers of noise, the vocals on Nothing Hurts are at the vanguard of the mix, and actually seem deep and honest - unfiltered and un-ironic emotions. Nothing Hurts packs a hard punch in contrast to its short length. Despite clocking in at less than 30 minutes, the damage done in that small amount of time will leave you reeling for days afterwards. The record moves fast, and is devoid of lulls and rest periods. First track and first single, Year’s Not Long makes quite a first impression - staccato riffs, infectious melodies and pounding drums. Then while you are recovering, All Things This Way comes along and hits even harder and faster with the most overt homage to punk on the record. Obviously not wanting to be pinned down by a single genre, the band closes the record with Worse to Come, an acoustic ballad featuring reverb-drenched and haunting backup vocals courtesy of Vivian Girls. Nothing Hurts is a more sombre and sincere take on the current lo-fi wave. There is no pretension or callous irony – just unadorned emotions juxtaposed against sonorous layers of sound. Male Bonding has produced a record teeming with energy and vigour. Like a shaken up bottle of Coke, Nothing Hurts is simply waiting to explode all over you.